The West Rock is a welded aluminum boat with a foam collar. 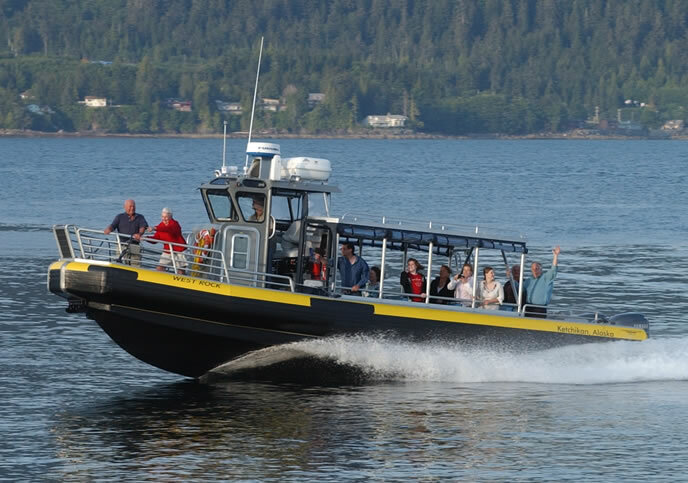 The boat was built in 2005 by Northwind Marine and is U.S.C.G. inspected and certified to carry 18 passengers. Designed by its owner and captain, Mike Holman, it is the first and only boat of its kind. It was designed to be fast and tough. Powered by three 225 h.p. Yamaha outboards the West Rock cruises at 29 knots and has a top speed of 35 knots fully loaded. The West Rock has enclosed seating for 12 passengers and a comfortable private restroom located in the forward part of the pilothouse. One of its most unique features is a hydraulic bow door which enables passengers to step easily off the front of the boat directly on to the beach. 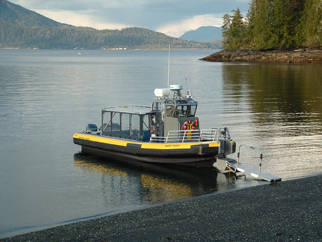 A removable bow ramp extension enables the West Rock to put passengers on shallow beaches without grounding the vessel. The West Rock also has a large flat screen t.v. which is used together with an underwater camera to view live underwater video. We have plenty of long rain jackets on board for persons of all sizes. Binoculars are also provided along with bottled water and a snack on every tour.